You can’t talk about the history of Manitoba without talking about Indigenous people and you’d be hard-pressed to talk about the history of Manitoba without mentioning hockey. 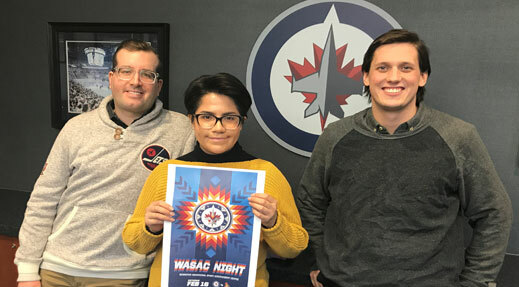 On Feb. 16 and 17, hockey and Indigenous culture will together be the talk of the town at the Winnipeg Jets WASAC (Winnipeg Aboriginal Sport Achievement Centre) Night, and the Manitoba Moose Follow Your Dreams Day, where True North’s hockey teams will celebrate the Indigenous cultures of our city and province. The centrepiece of the games will be the specially created logos for both the Jets and Moose that are inspired by Indigenous arts and culture. The logos are as unique as they are beautiful, yet it’s the story behind them that truly shows the meaning of the celebratory games. That help came in the form of Leticia Spence, a Cree, Red River College graphic design student who is also involved with WASAC, the organization True North has been collaborating with to make these games happen. “Her wealth of knowledge on Indigenous culture and artwork and that visual language, as well as her experiences as a designer really provided us with a solid footing for the ability to create some logo and branding that resonated with the Indigenous community and lent everything an air of authenticity that we probably wouldn’t have been able to achieve without her help,” continued Dudych. When Spence was offered the spot of collaborating on these logos, she jumped at it, knowing it was a way for her to give back to the Indigenous community and share her culture. Originally from Pimicikamak First Nation (Cross Lake), Spence drew on her own personal life for this aspect of the logo. “A lot of my family does beading. That’s been passed down from my auntie, and so when I was thinking about this design, I was thinking about my Auntie Betsy and the patterns she would make for our moccasins that she would give us every Christmas. With so many artistic styles to draw from, the Moose logo brings its own unique aspects of Indigenous art and culture to life. Kevin Jorgensen, one of True North’s graphic designers, worked closely with Spence on both of the logos and the branding around them, and was nothing short of impressed by her work. Kevin Chief, one of the founders of WASAC, agrees on the beauty of the logos, saying that he was “blown away” when he saw them. He was just as blown away by the mentorship and the opportunity being provided. The idea of showing instead of telling is a big one for Chief. And he knows that the games and the logos will show all Manitobans that this is not just a celebration of Indigenous culture; it’s a celebration of Manitoban and Canadian culture.